Most off-road vehicle ramps at the Cape National Seashore have now reopened, but a few remain closed because of the flooding caused by two weeks of torrential rain and ocean overwash in late September and earlier this month. The four ramps still closed are in Buxton, Frisco, and Ocracoke. They are Ramps 43, 44, and 45 in Buxton, Ramp 49 in Frisco, and Ramp 72 on Ocracoke. The Buxton ramps lead to Cape Point and are heavily used by surf fishermen, especially in the fall. Ramp 49 is a favorite for fishing, walking, and other recreation, as is Ramp 72 to South Point on Ocracoke. The beaches at all of the closed ramps are open to pedestrians, who would have to park at nearby areas and hike to the beaches near the ramps that are closed. The Pole Road near Ramp 55 in Hatteras village, which had been closed, opened this afternoon. Also opened today was Ramp 4 on Bodie Island, which is restricted to one lane of traffic and a 5-mph speed limit. “There is still saltwater on this ramp, so enter at your own risk, watch for oncoming traffic, and stay within the posted lane,” the Park Service said on its Facebook page. Hatteras Island District Ranger, Joe Darling, who inspected the Hatteras ramps today with Ranger Peter Malionek, said that flooding on the Pole Road dried out quickly overnight. “It has some storm debris in the roadway but overall is in good shape,” Darling said. Darling also said that the water levels in Buxton are receding, but aren’t ready for reopening. 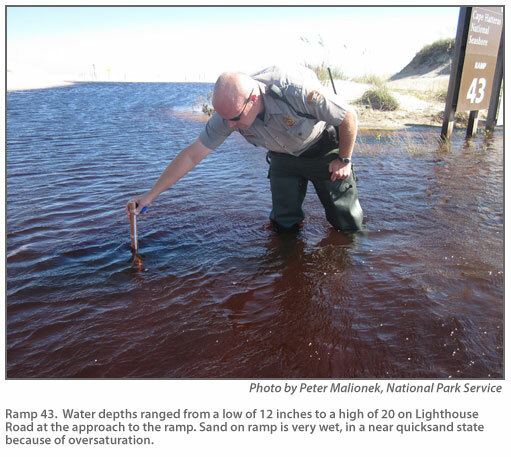 Water levels remained from 12 to 24 inches at various areas along Lighthouse Road leading to the ramps and the Cape Point Campground and on the ocean side of Ramp 44. However, Darling said that the water levels at Ramp 49 in Frisco, if anything, seemed deeper today than they had been — perhaps because of drainage from the wetlands to the north in Buxton. The water levels there averaged 18 inches, but got as high as 24 inches in spots. Also, after the storms of the past several weeks, only one sea turtle nest remains on the seashore to restrict night driving. The seashore had a record number of turtle nests this year — 289 of them. There were only 34 left to hatch when the stormy weather started two weeks ago. After the first week, seashore staff members found eight of 23 nests on Hatteras Island that were still viable. There were no remaining nests on Bodie Island or Ocracoke. The one that has survived is seven-tenths of a mile south of Ramp 30. It is expected to hatch soon, perhaps tonight, according to the seashore’s natural resource program manager, Randy Swilling. This area between Salvo and Avon is accessible to drivers and pedestrians from both Ramps 30 and 32, but there is no through access between the ramps. The beach is closed at night to ORVs from two-tenths of a mile to 1.2 miles south of Ramp 30.